It’s not that hard to be a Jewish artist, or even an artist creating Jewish work here in Chicago; however, being a proud strong Jew at the School of the Art Institute of Chicago is harder than one would expect—it’s not so hip to be religiously affiliated at art school. Fortunately, Hillel Arts in the Loop, a Hillels Around Chicago program, has presented itself as a group that unites us because we are Jewish and have a common heritage, giving me a sense of place and belonging, something I believe that many of us strive to find. 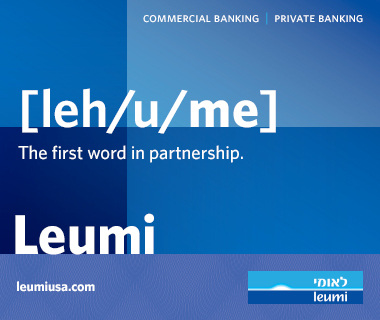 Hillel Arts in the Loop is a program that has helped me explore my Judaism through my art, introduced me to Jewish students at my school, and become acquainted with the Jewish community here in Chicago. Hillel Arts in the Loop kicked off our fall semester with projects and events we plan to tackle throughout the year. 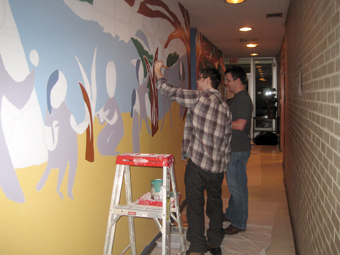 One successful project accomplished at the end of the Spring 2010 semester was a mural at the Ethiopian Community Association of Chicago. Because of the success of that mural, Hillel Arts in the Loop was offered an opportunity to create a new mural at The ARK this year. Tikkun olam, or repairing the world, is every Jew's responsibly, something I learned at a very young age and Hillel continues to teach. Erin Jones, program director of Hillel Arts in the Loop, introduced us to The ARK, a JUF grant recipient, that has been repairing our world since 1971. Jewish students from The Art Institute of Chicago volunteered one Sunday at The ARK to help sort food for The ARK’s pantry. Our goal was to help The ARK continue to reach out to more than 3,500 people a year. We took a tour and learned of the many services provided by The ARK, including medical services free of charge to distressed Jewish families. 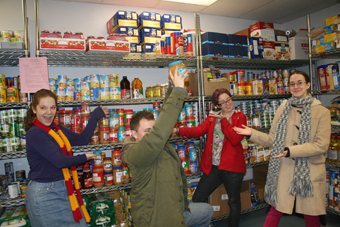 The ARK also has the only Kosher food pantry in Chicago, and profits from their thrift store benefit the less fortunate in these rough economic times. Like Hillel, The ARK treats every Jew the same regardless of observance. Upon seeing and learning about The ARK, we were inspired! Through collaboration between The ARK and Hillel Arts in the Loop we were invited to design a mural. As artists we have a special connection to God because like Him, we create. I, along with artists Samuel Eisen, Karina Fisher, Cara Frazin, Jonathan Frazin, Justin Katz, Jamie Lee, Rob Steinberg, and others designed and painted a mural in a Chagall-like style. The location of the mural is along an interior wall most viewed by clients of The ARK. We believe that the mural and its colors will enliven the walls of The ARK. This is important because asking for help is difficult for any family and the mural is there to remind us that we are in this as a community. 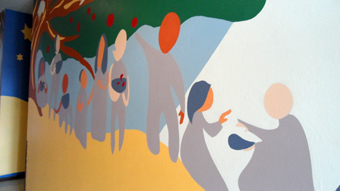 The mural depicts individuals giving and receiving help. The colors are bright and bold specifically chosen to spread warmth. Jan. 30 marked the dedication of the mural at The ARK in the presence of Hillels Around Chicago and The ARK staff and community members. I presented the mural to The ARK and to Miriam Weinberger, The ARK’s executive director, describing our depiction of the community helping one another to self-sufficiency. During the dedication Miriam mentioned that the week’s upcoming Torah portion was Terumah—the Jews had been traveling for 40 years, and God instructs them how to build and adorn of the Ark of the Covenant. This year celebrates The ARK’s 40th year and Hillel Arts in the Loop artists have adorned it for the comfort of its clients. Chaya Brick is a senior at the School of the Art Institute of Chicago. Hillels Around Chicago is a division of The Hillels of Illinois, and is supported by the Jewish United Fund/Jewish Federation of Metropolitan Chicago and Hillel: The Foundation for Jewish Campus Life. The ARK is a JUF grant recipient in support of services provided to the community.